Denny Jump (Bellevue, WA, United States) on 5 December 2017 in Animal & Insect. Often times, I would take this back country route to the office and I was never dissatisfied...Always beautiful and relaxing...When I came up over a hill and down the other side to see these Turkeys, for some reason the first thing that came to my mind was the thought of John Candy and Steve Martin riding along the wrong side of the road in that famous and hilarious movie. Perhaps just flown in from the keep-left UK ?! @Ronnie 2¢: Precisely!! I noticed that as well ;-) Better to stay let than Right - especially when Right is Wrong! Cheers sir! 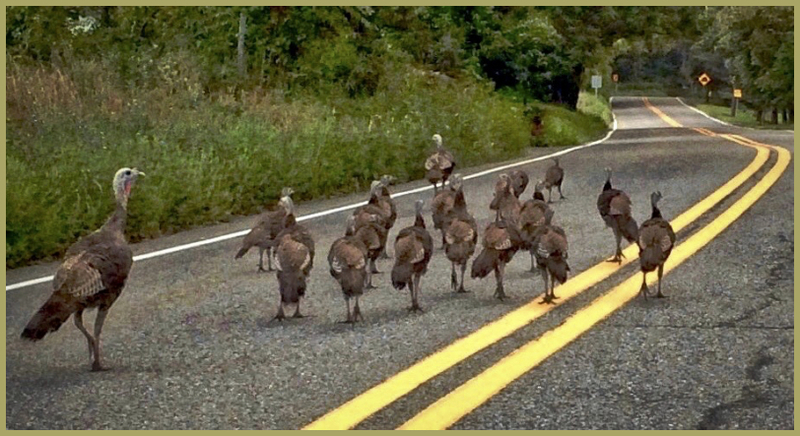 This can be a Wacky Wednesday shot, then... nice framing of these jive turkeys using the road as their own personal travel-way. I encountered a bunch of wild ones a few years ago and photographed them as well; will post that one of these days, but they weren't on the road like this! Great shot. Cute capture with a caption that says it all!! Off to the turkey races! A very cool find with all these birds. I notice some older birds seem to be looking out for the smaller, younger birds. I agree about all the turkeys in the government! I have only a wild turkey once. I know that they are around here but they seem to be well hidden! A great image! Hope that they get off the road soon! A cool photo! They are walking on the correct side of the road by my Aussie reckoning ;-) Just because you drive on the wrong side... Also, there are lots of turkeys in any government really.